SOAPware DocumentationSOAPware FAQ'sFAQ's MiscellaneousQ: How do my nurses let me know when a patient is ready to been seen? A: The information can be entered into the Add Document Task dialog. 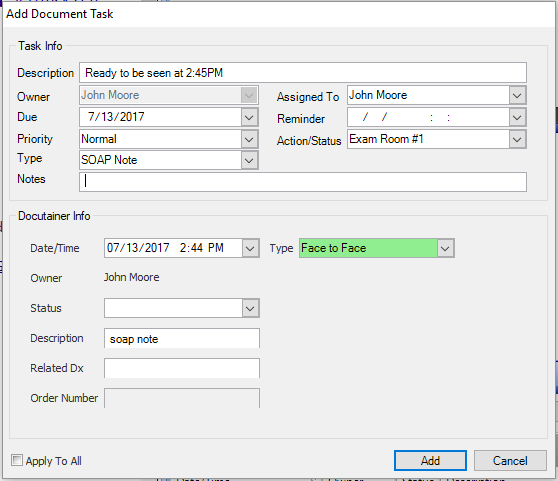 Room numbers can be created in the Action/Status column to reflect the exam room the patient is in, and the time the patient was checked in can be typed in the description line. **Remember, this dialog is derived from clicking the Add New Docutainer button. Previous Lesson: Q: Why is my patients chart empty? Next Lesson: Q: How can I tell what version of SOAPware I am running?